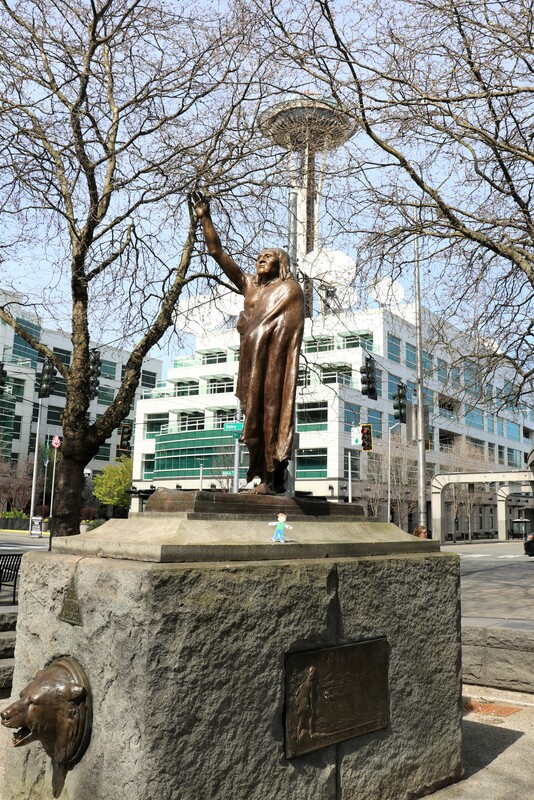 Chief Seattle | The Happy Wonderer ~ ellen b. 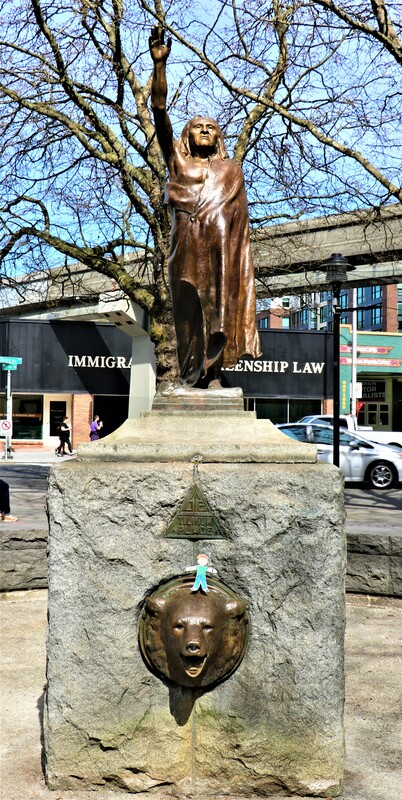 After we left the University, Laura and I took Flat Stanley to see The Fremont Troll, some floating houses, views of the Space Needle and a statue of Chief Seattle. 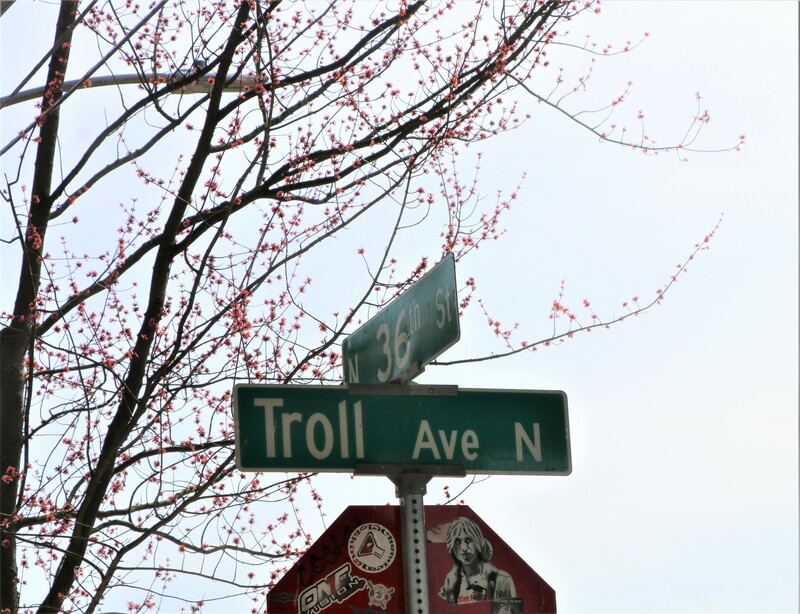 Here’s a link if you want more information on the Troll. 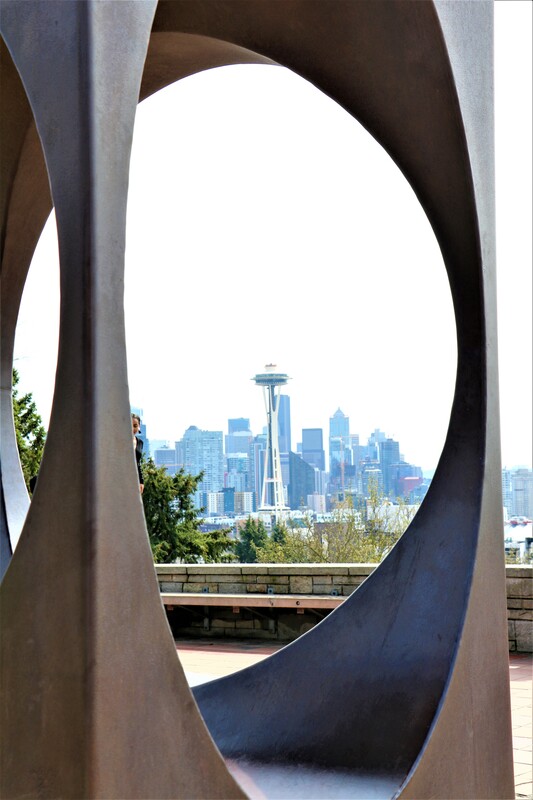 The sad thing about this fun Seattle sight is that drug addicts have chosen to use this sight to shoot up and discard their needles here. When we were there a concerned citizen had already picked up over 30 discarded needles. He was warning people with children to watch out. 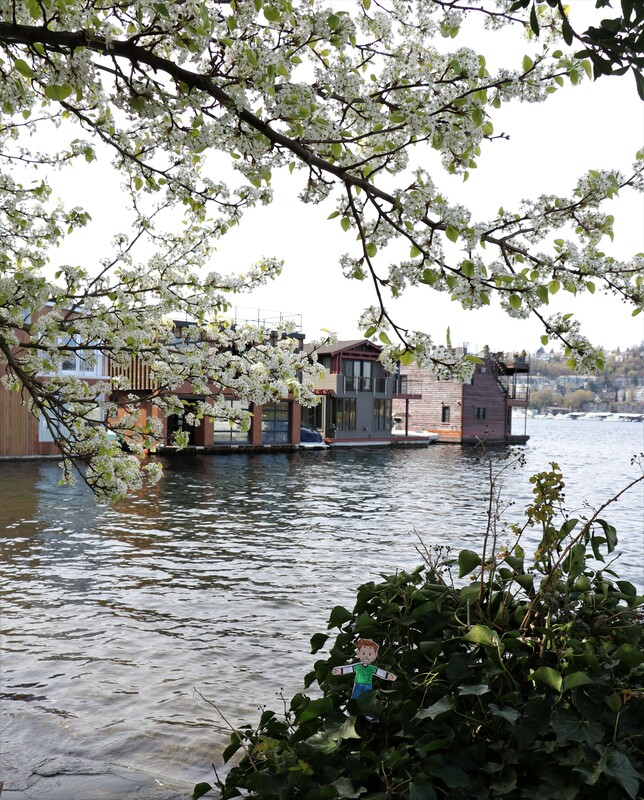 Some of the floating houses on Lake Union in Seattle. 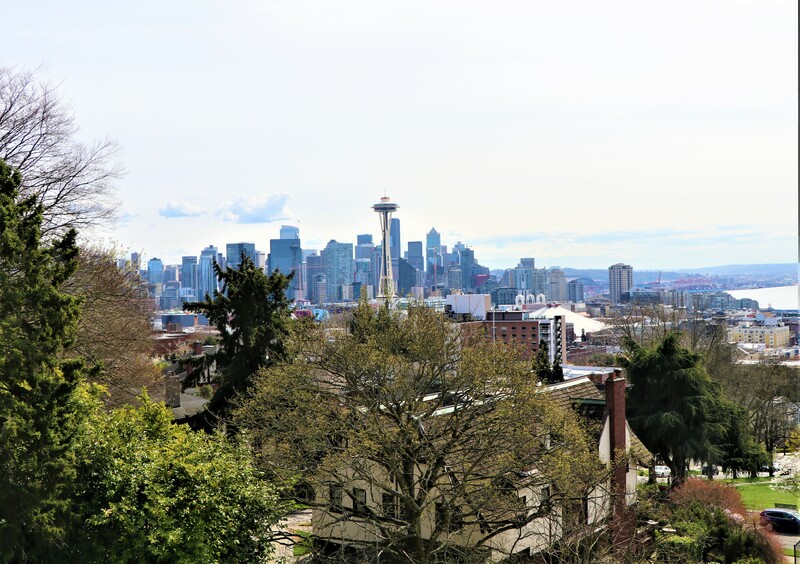 Views of downtown Seattle from Queen Anne’s Kerry Park. 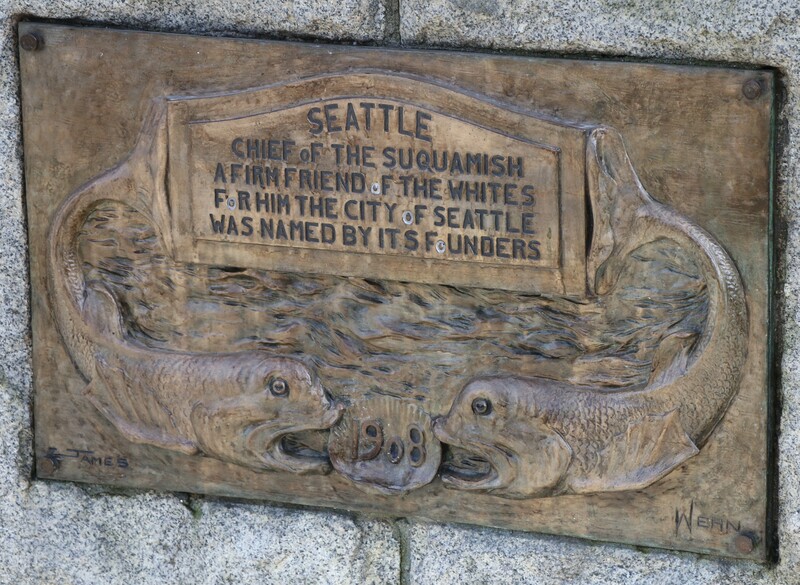 Seattle, Chief of the Suquamish, A Friend of The Whites. 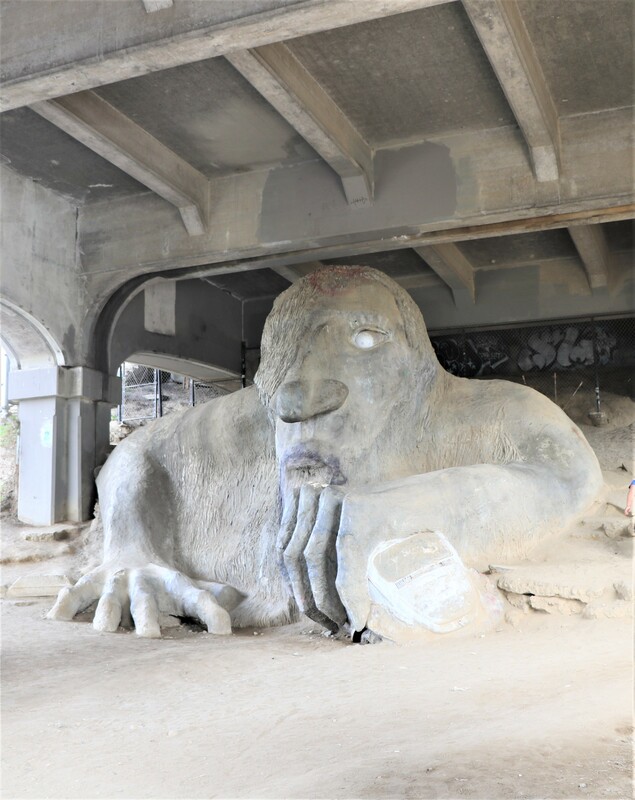 For Him the City of Seattle was named by it’s Founders. This week I’m adding three quotes from my readings that I want to remember. I’ll be sharing the full hymn on a Sunday in the future. This last quote and the longest is from The Gospel According to Jesus by John MacArthur, page 46. “The call to Calvary must be recognized for what it is: a call to discipleship under the lordship of Jesus Christ. To respond to that call is to become a believer. Anything less is unbelief. Have a Thursday filled with good thoughts! 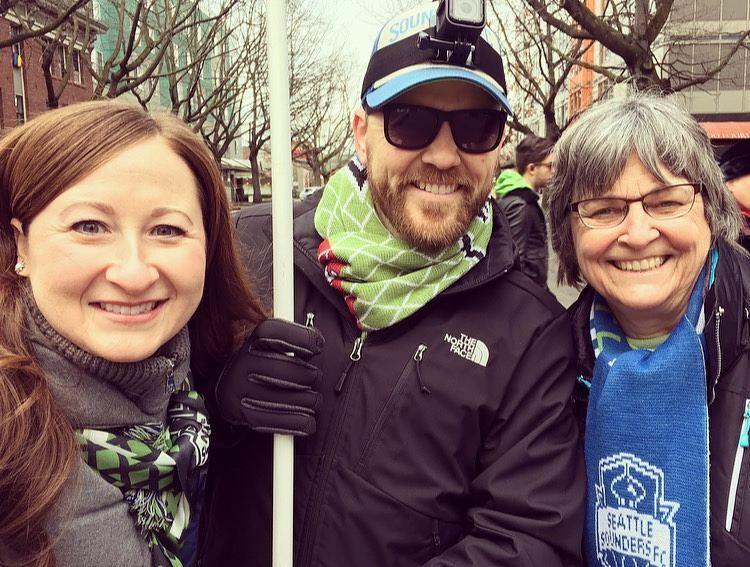 This is another one of those posts that is all about the history of my soccer enjoyment. 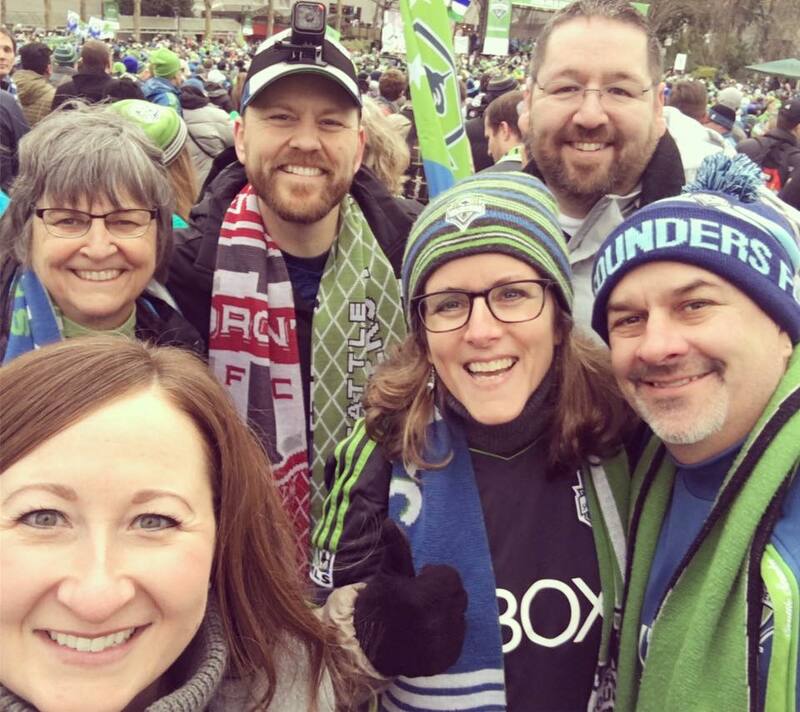 For a Seattle Sounders Soccer fan and season ticket holder our 2016 season ended with our boys capturing the Gold Cup. The thing that makes it amazing is that we were in last place in the middle of the season with any hope of making the playoffs questionable. Then from the bottom we had a turn around, a new coach, a new player, a new inspiration. Injured players recuperated and came back strong. The team had a strong determination and new vision. 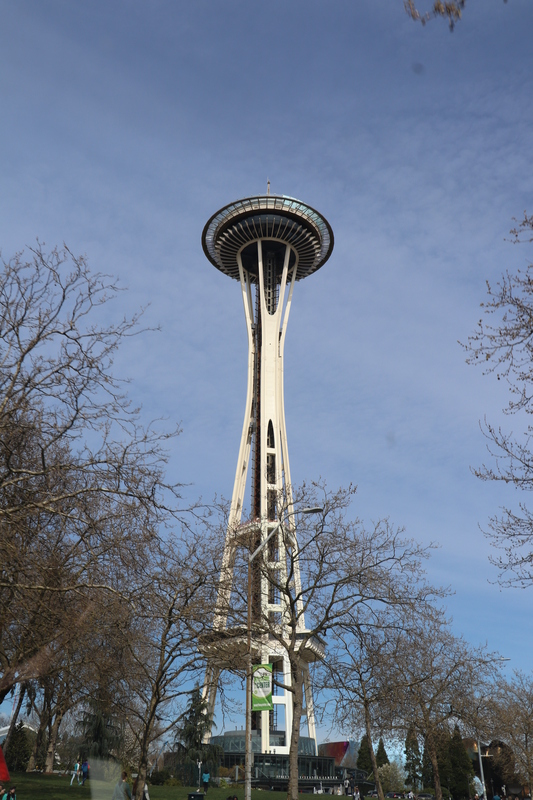 On Tuesday December 13th Josh, Laura and I drove downtown to be a part of this history and enjoy the parade and rally. Josh and Laura just got back from Toronto on Sunday and were able to be at the final game and cheer on the Sounders with 2000 or so fans. It was now time for the Washington State Fans to come out and give the team the thunderous appreciation we wished they could hear in Toronto! This photo above is from their victory celebration in Toronto, Canada. 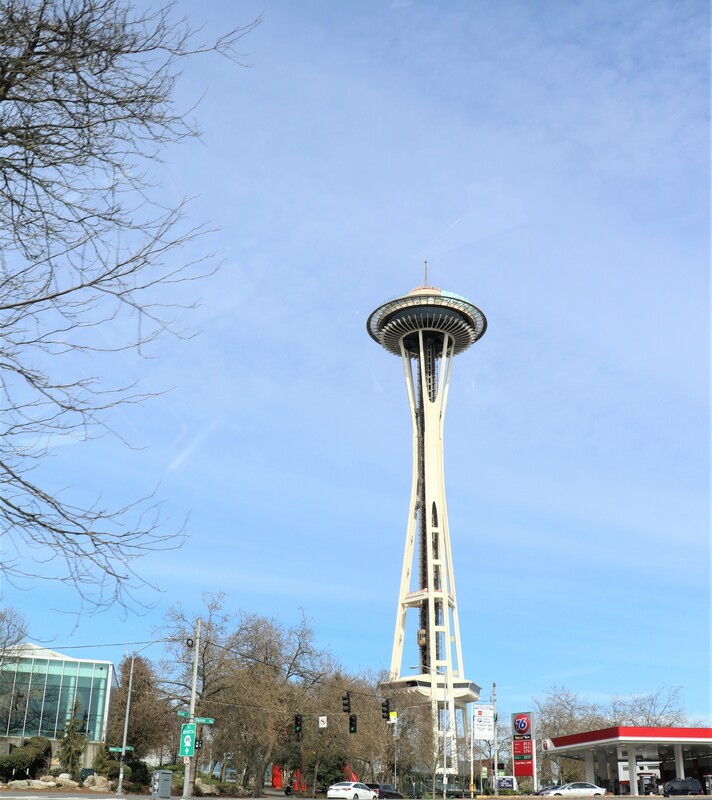 We found our spot close to Seattle Center and waited for the parade to come to us. Josh bought this flag to take to Toronto with him and Laura since it has a likeness to the U.S.A. flag. I turned around at one point and saw some of our friends from Northshore Community Church. This little guy was so cute. 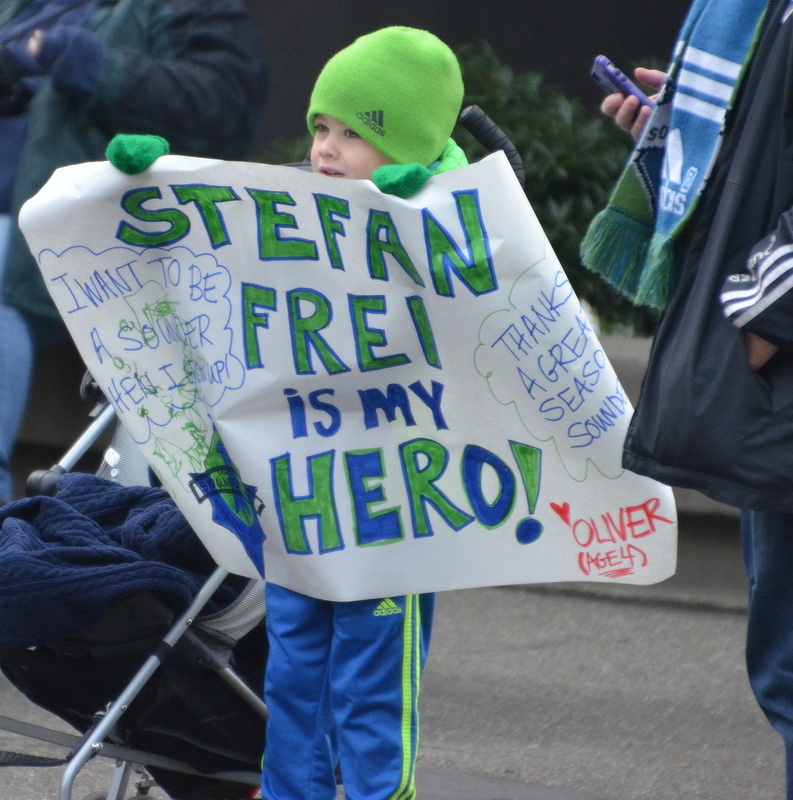 By the way Stefan Frei, our goalie, was the MVP of the game with his save of year that will go down in soccer history, too. 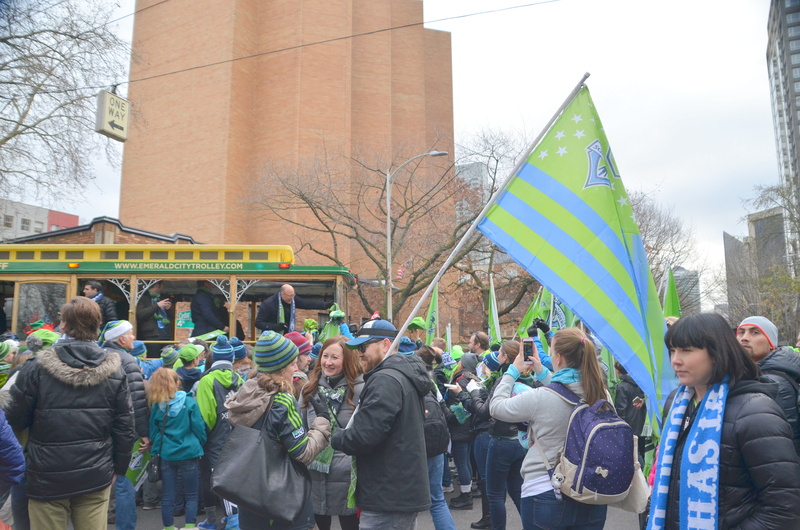 Finally the trolleys with the players approached with all the fans along the route joining in the procession. 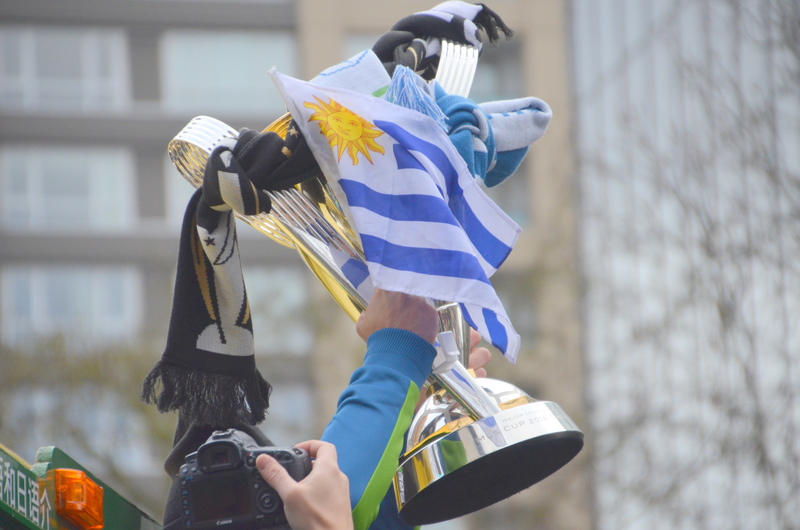 Nicolas Lodeiro holding the MLS Cup out the window for all of us to see. The added flag is from his home country of Uruguay. 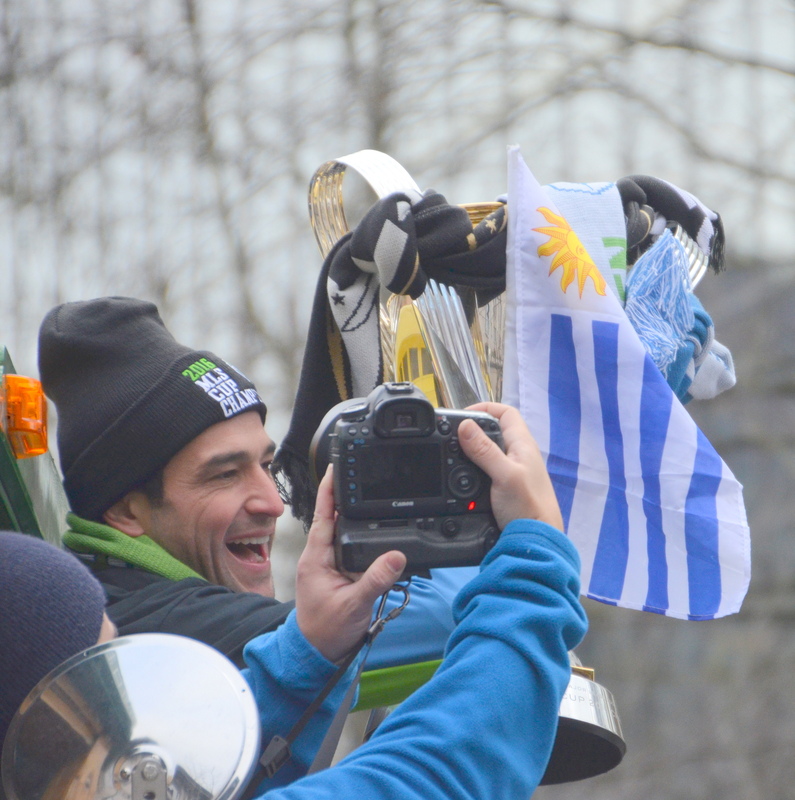 Lodeiro is a player who came to our team at our lowest point and with his playing ethic and spirit helped our team make a turn around. 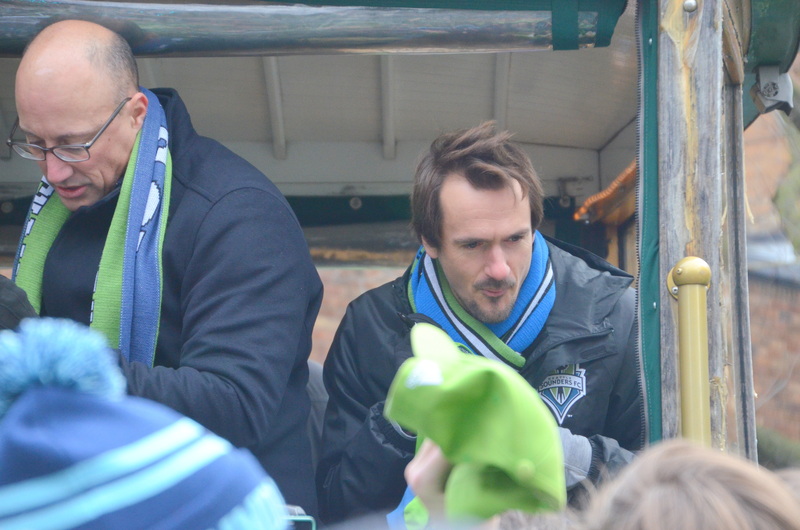 Some past players that the Sounders fans always enjoy seeing, Kasey Keller (former goalie) and Roger Levesque, a fan favorite for many years who is now retired from soccer. 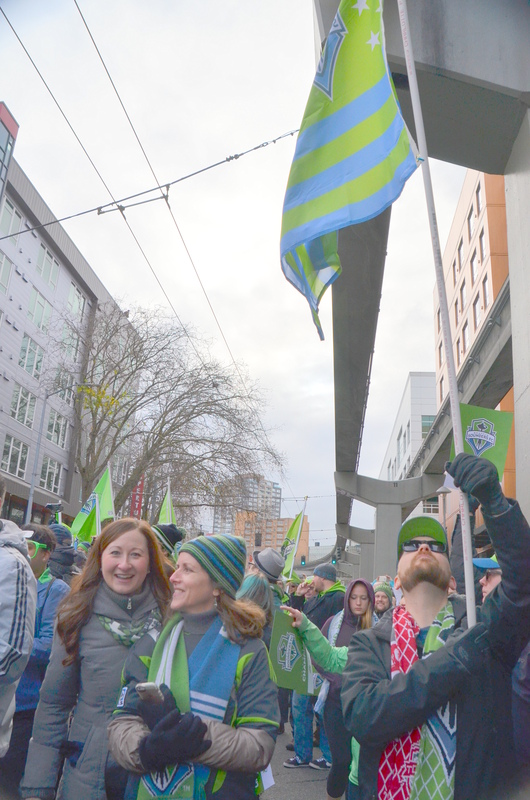 We met up with more friends and joined the throng headed to the Seattle Center for the rally. 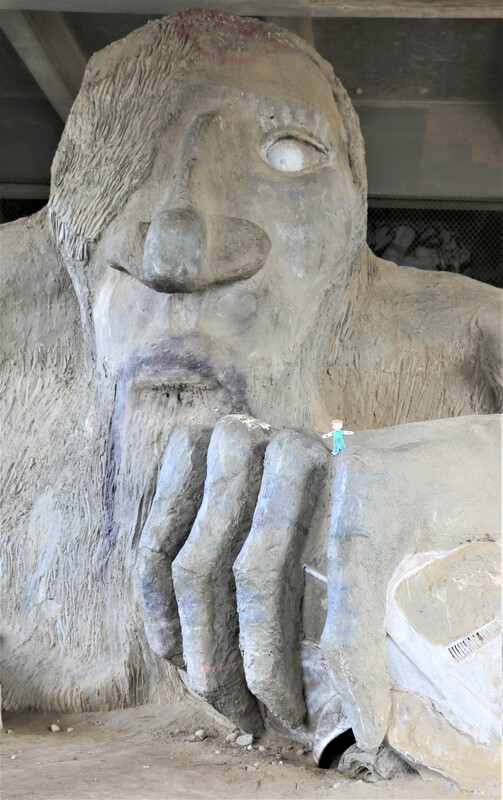 Look at that green beard! 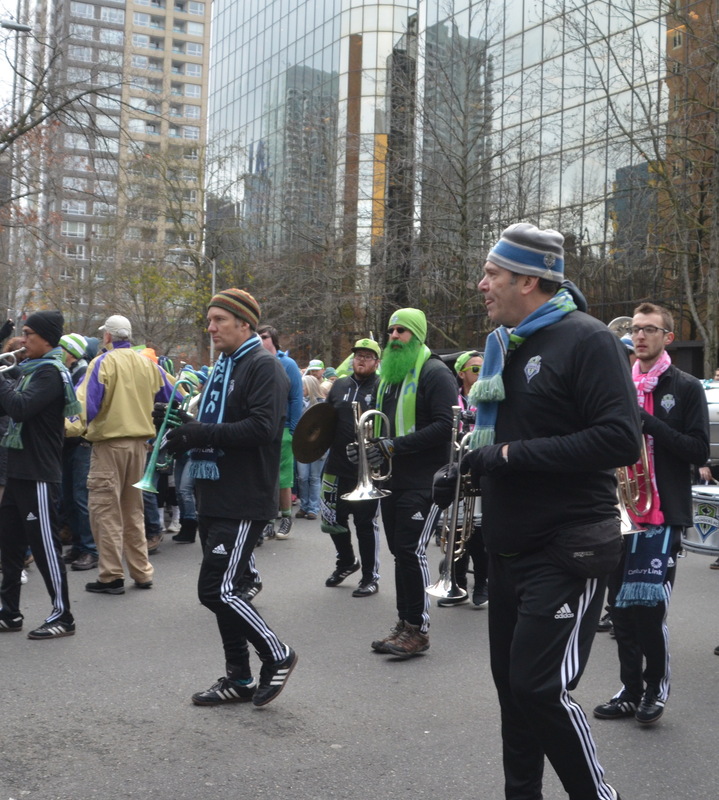 This is part of the Sounders band. 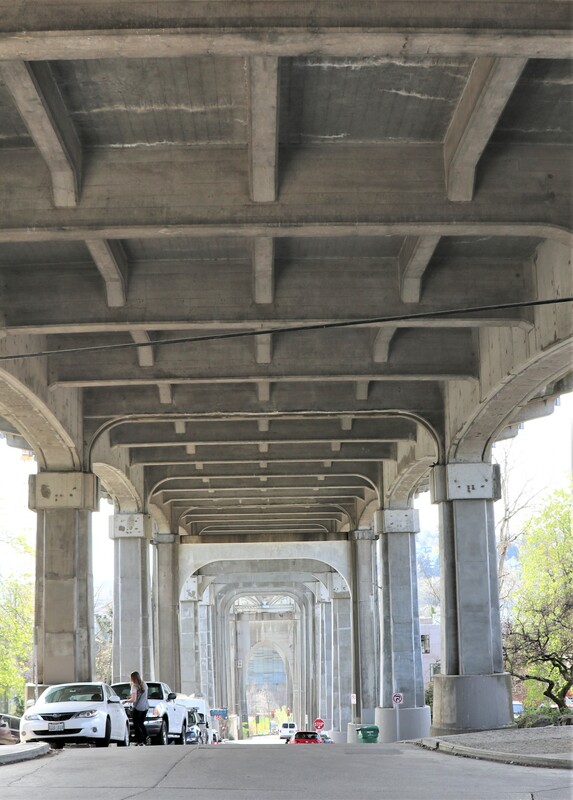 Walking under the monorail tracks to the center. 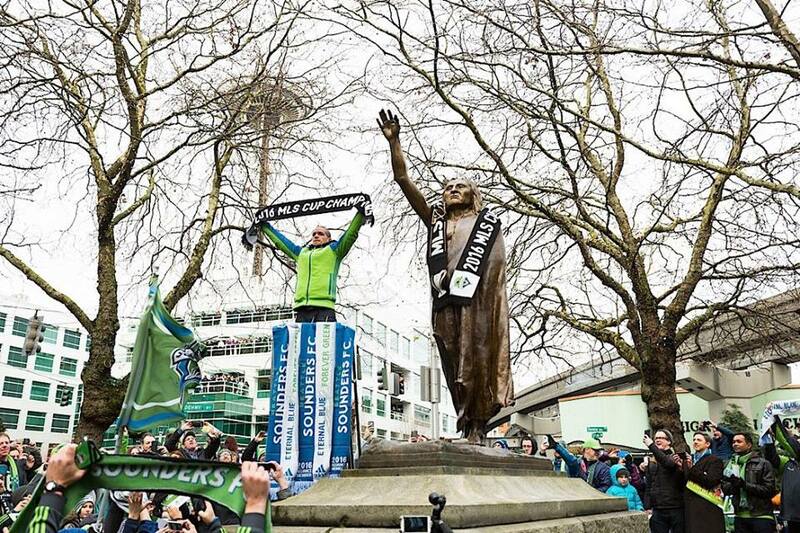 The Trolleys stopped and our team captain Osvoldo Alonso raised the MLS Cup Champions flag next to the statue of Chief Sealth (Chief Seattle), whom the city of Seattle is named after with historical controversy. Alonso is a Cuban born soccer player who defected to the U.S.A. and is now a citizen of the United States. Our daughter in law actually submitted this to her boss to fly to Toronto last Friday. He said it was a very compelling reason to miss work. 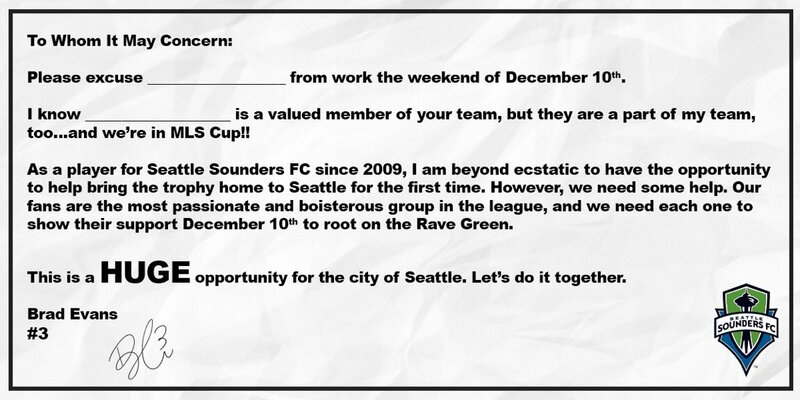 This excuse form was used by some for the parade and rally, too. 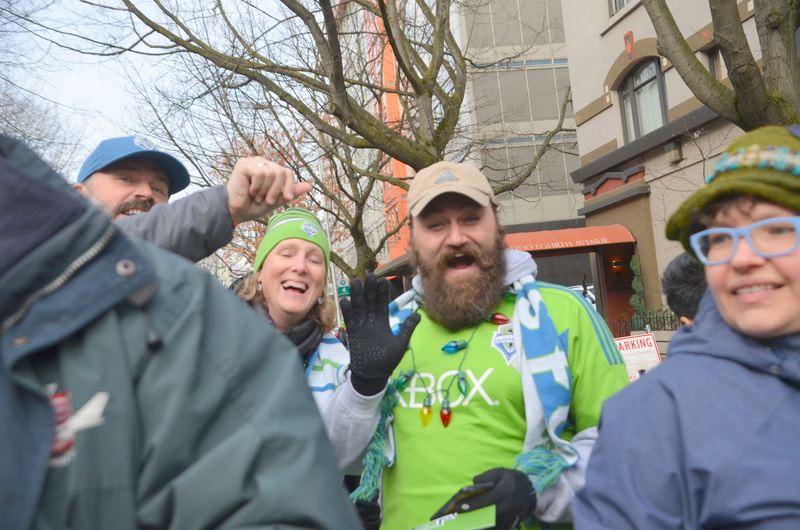 This is Zach Scott, another fan favorite who has been with the team from the beginning. He led the crowd in the Jingle Bells Song the team has always sung in the locker room after an away victory. 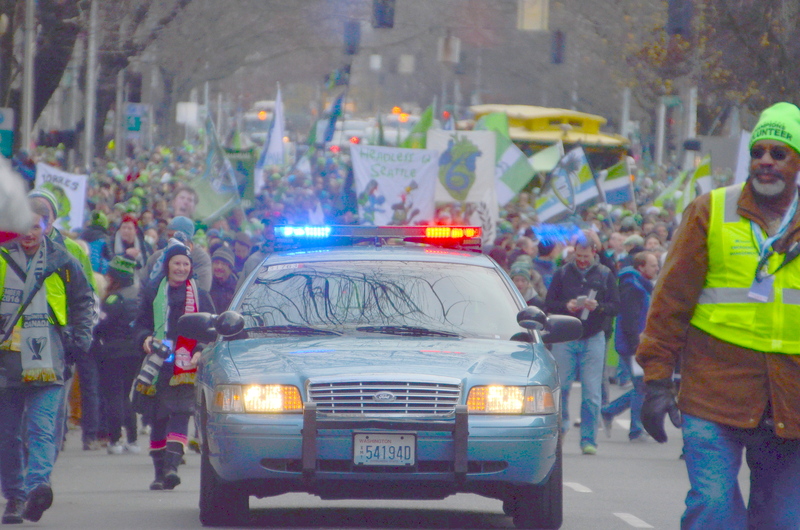 This was Zach’s last season with the Sounders. He will be missed. 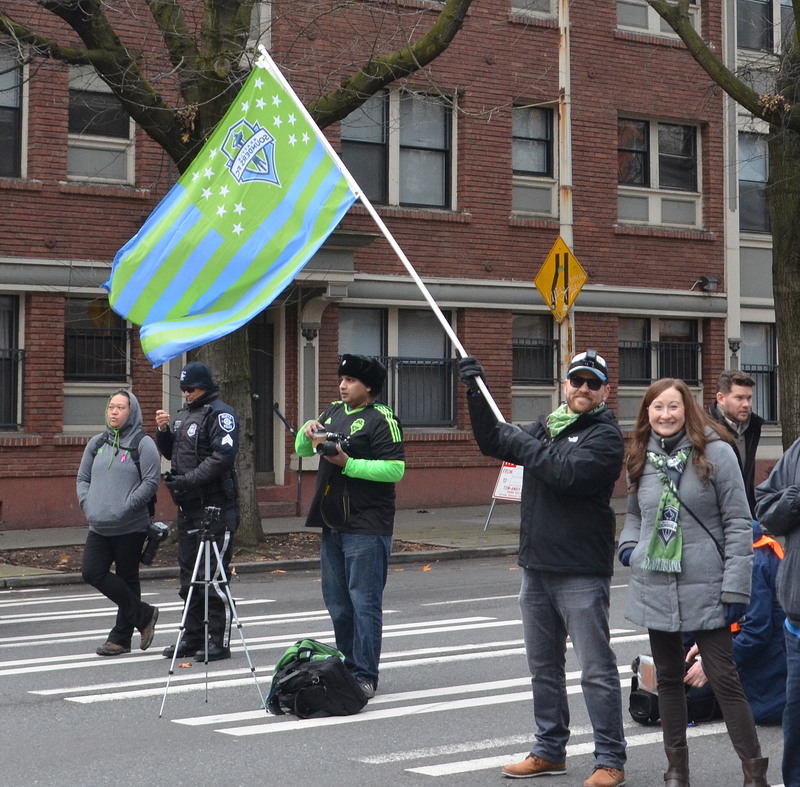 Jingle Bells, Jingle Bells, Jingle all the way, Oh what fun it is to see Seattle win away, hey! 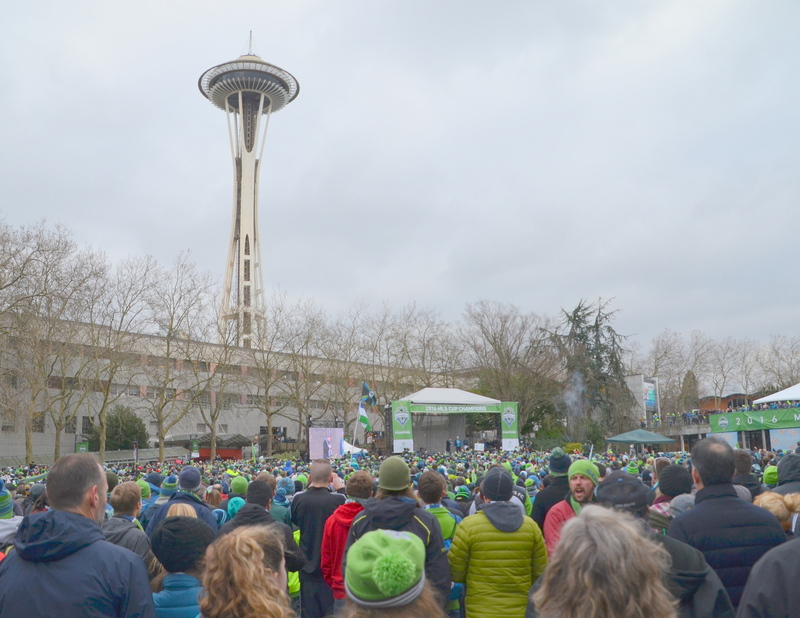 It was fun to hear a crowd of thousands sing along. 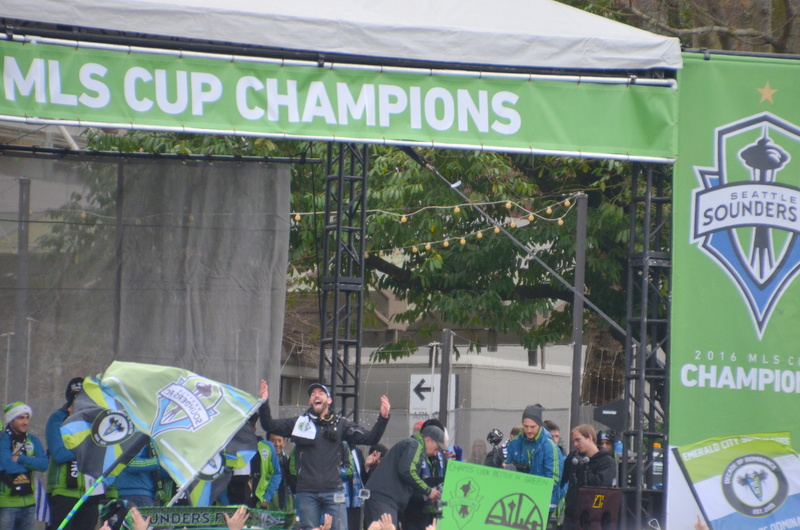 2016 Seattle Sounders MLS Cup Champions! Look at that sea of supporters behind them! 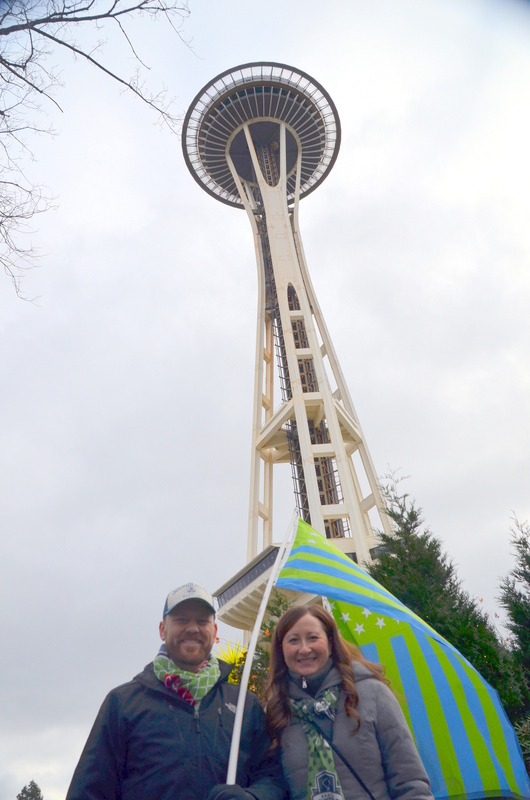 The following day the Sounders flag was raised by Coach Schmetzer and Governor Inslee at the capitol building in Olympia, Washington. 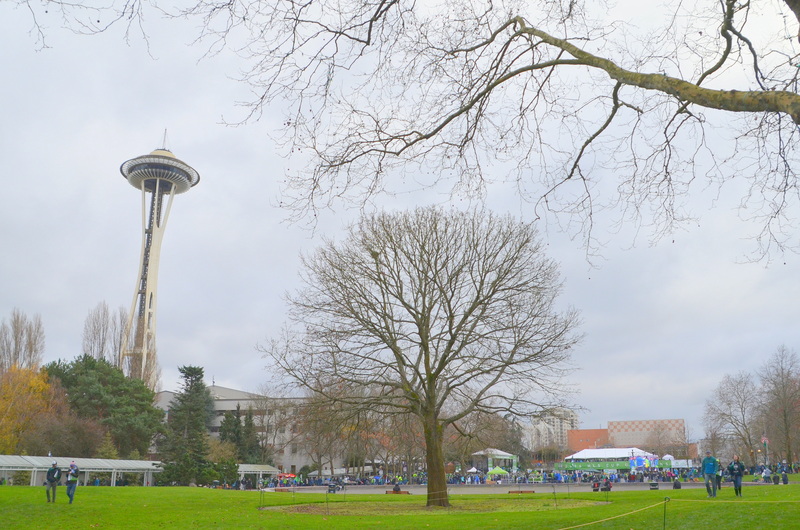 It was a fun event to attend and we were happy to brave the crowds and the cold to be a part of history. For the record and in case anyone out there is concerned, I do not worship soccer or soccer players but I enjoy soccer and have an appreciation for the skill and stamina it takes to play this sport. Since watching our sons and daughter play soccer in the 90’s I’ve grown in the understanding of the game and have learned to appreciate the development of play between the players on the field. Now I’m headed to the kitchen table to finish my Christmas cards so I can get them in the mail tomorrow! 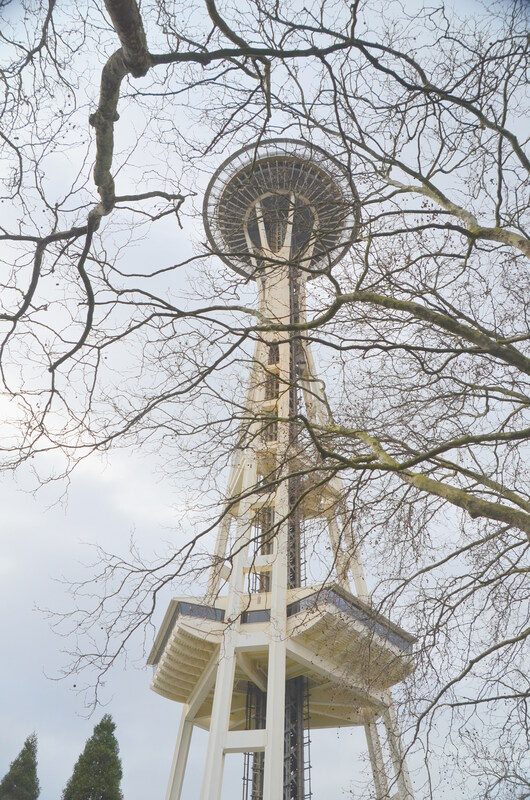 We are below freezing in temps here on our hill in the Seattle suburbs. Brrr. Good day to stay inside and work on our Christmas greetings. Hope you all are cozy and warm.